Description: Originally bundled with a special edition platinum GameCube console. 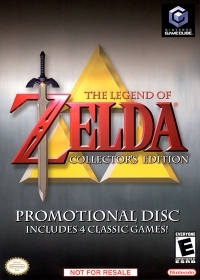 Includes 4 classic Zelda adventures and a demo of LOZ: Windwaker. 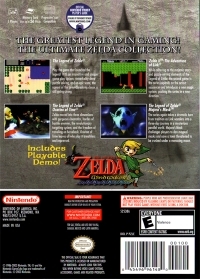 Box Text: The Greatest Legend In Gaming! The Ultimate Zelda Collection! Play the game that launched the legend! With an innovative and unique game-play system, remarkably deep puzzle solving, and an epic score, the appeal of this groundbreaking classic is still strong. 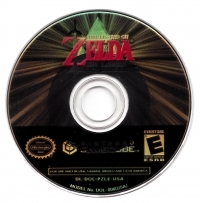 While adhering to the majestic story and puzzle solving elements of the Legend of Zelda, the second game in the series expands on the action sequences and introduces a new magic system, pushing the series in a new direction. Zelda moved into three dimensions with gorgeous cinema tics, hordes of hostile enemies, the revolutionary targeting system, and the freedom of traveling on horseback, Ocarina of Time leaves all who play it breathless and impressed. The series again takes a dramatic turn from tradition as Link wanders into a three-day journey in a mysterious parallel world. Majora's mask challenges player to don magical masks and save a town threatened to be crushed under a menacing moon. This is a list of VGCollect users who have Legend of Zelda, The: Collector's Edition in their Collection.